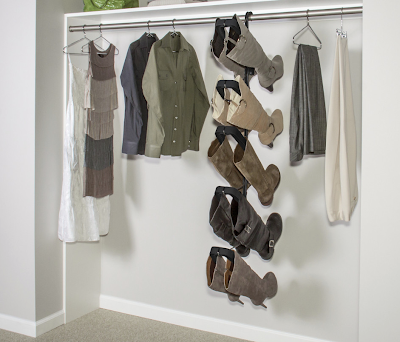 Shoe storage is a challenge for lots of folks, and boot storage has its own challenges. But I’ve got some potential solutions to show you! 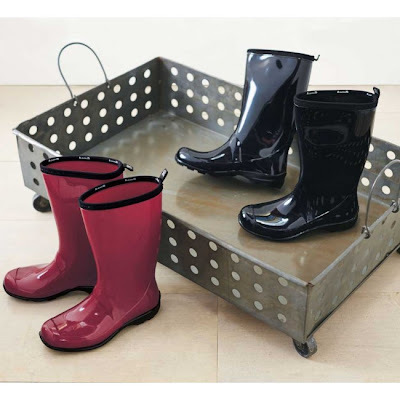 Some will work well with wet boots; others are more suited for storing those that have already dried out. 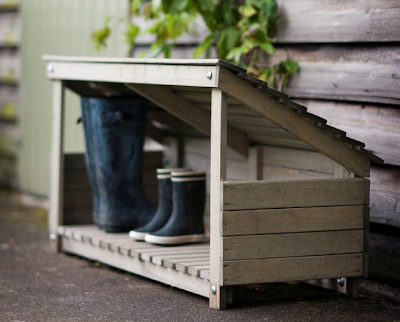 Some are intended for inside use and others for outdoors. Many of them come from the U.K. The first option is a boot tray of some sort, such as this rubber tray from Ballard Designs. VivaTerra says this rolling metal boot rack will stand up to the elements. 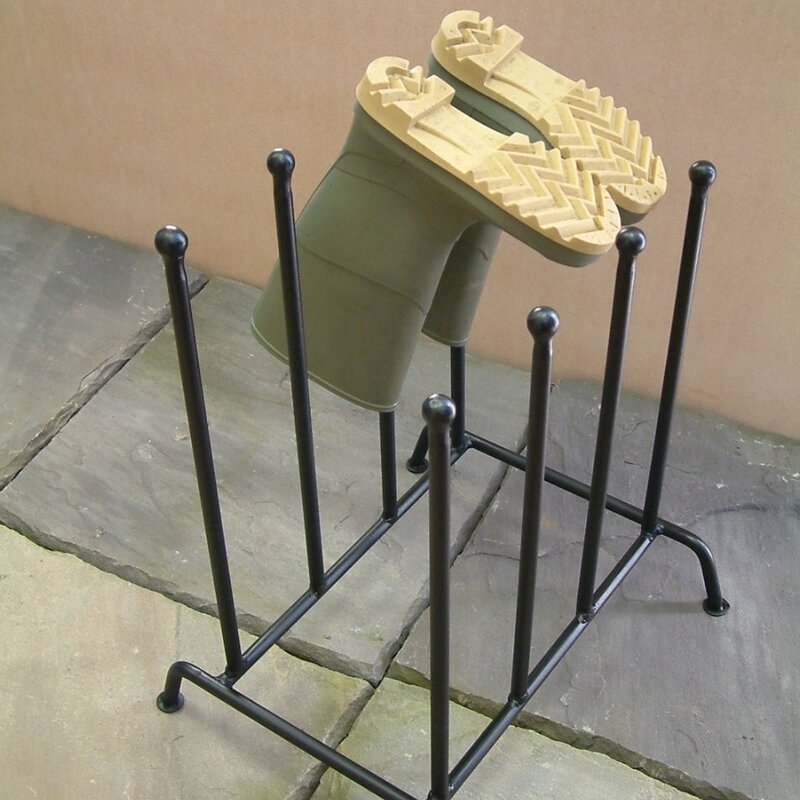 Another option is a boot stand, such as this Welly boot stand from Make Me Something Special. 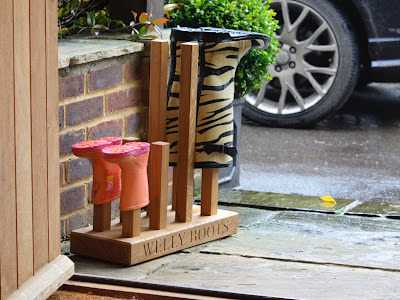 For a totally different look, there's the Welly rack from Dean Forge. 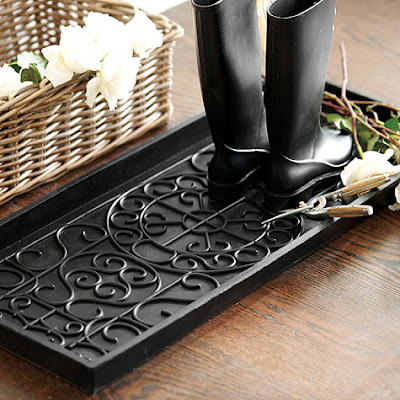 Another place to get this style is Studio Forge. A wall-mounted boot rack is another possibility. This one comes from wellyracks.com; the racks are available in a range of colors. Nether Wallop Trading Co also has a nice-looking boot rack. 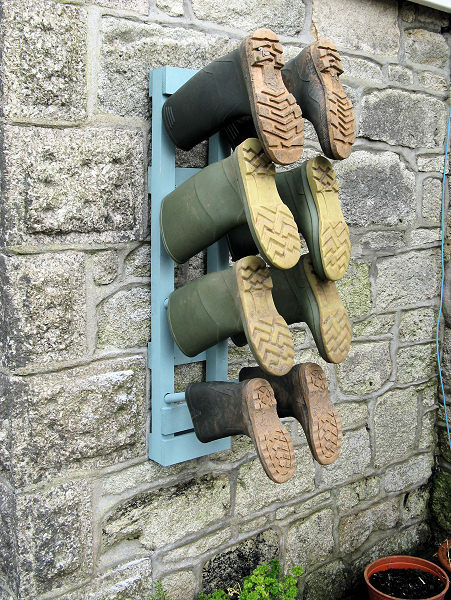 And for a different style of wall-mounted boot rack, we can go back to Make Me Something Special. 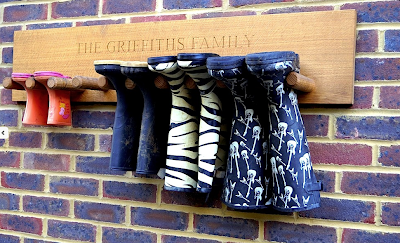 Want to hide the (dry) boots away? 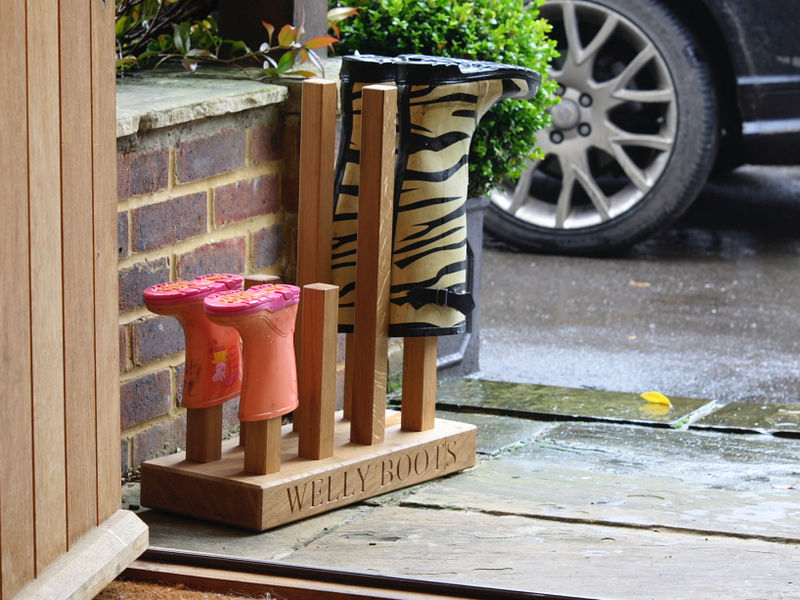 You could use the Wellington Boot Box. 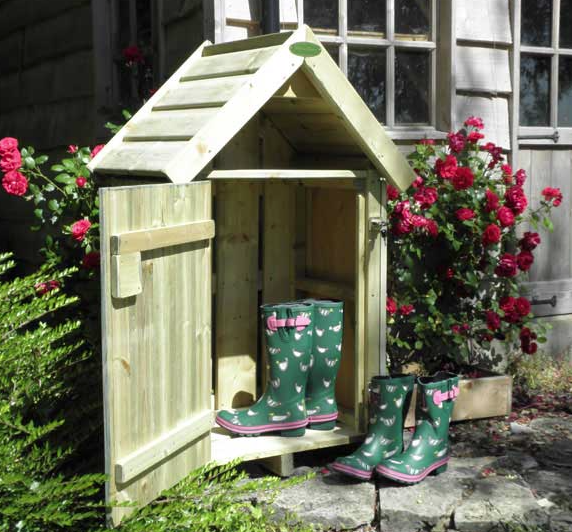 This is The Welly House from Flyte So Fancy. 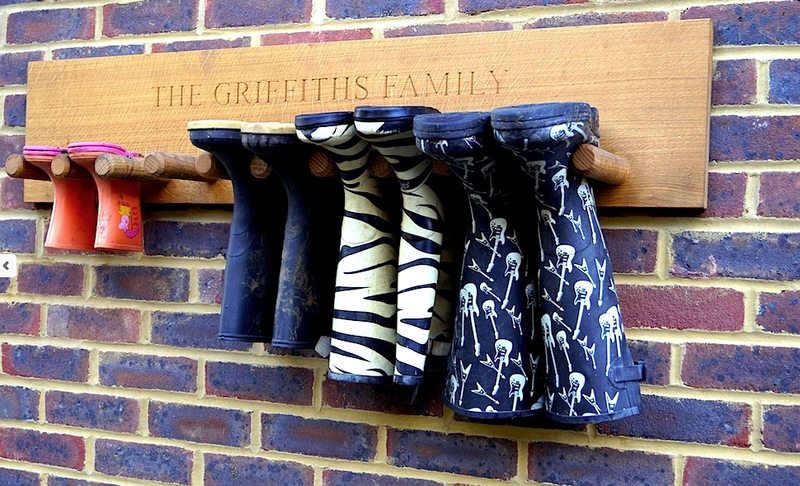 It’s designed with sufficient ventilation to keep any wet footwear well aired. Finally, Garden Trading has this Wooden Welly Store. Want more ideas? See my prior post on boot storage! Ask we look through our possessions as we declutter, we ask ourselves questions — and sometimes you may find a particular question helpful. 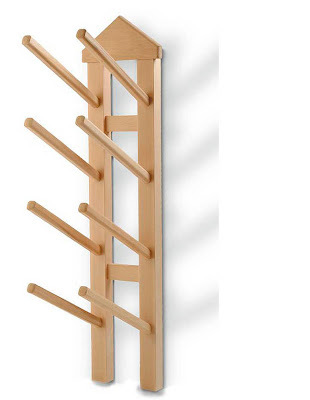 You’ve probably heard some of the standards, such as: When did I last use this? 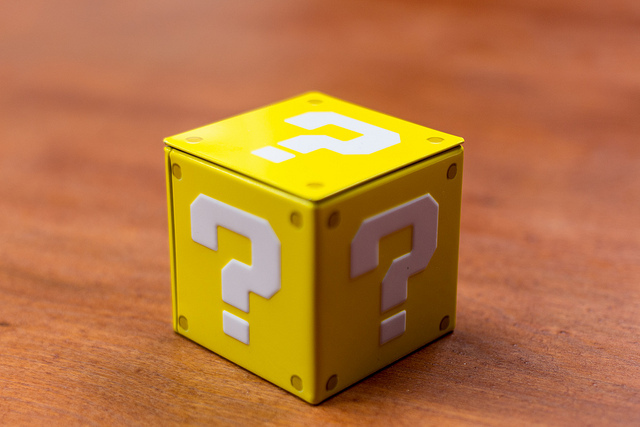 Here are some of the many other questions you might ask; pick any that work for you! 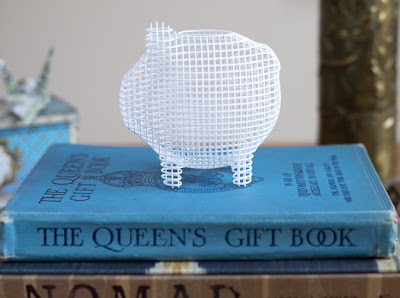 Saving Things "Just In Case ..."
Newsmakers doesn’t seem to be making its piggy banks (which come in cow, sheep and pig versions) any more, but you can still find them at babatude and Not on the High Street. The banks are made from lacquered wood; the hind end is removable so you can get to the coins when needed. Update on April 17, 2019: I'm no longer finding these banks anywhere. In 1973 Palaset received a commission from the Swedish Föreningsbanken Bank: a piggy bank for children with the intention of cultivating in them the habit of saving. 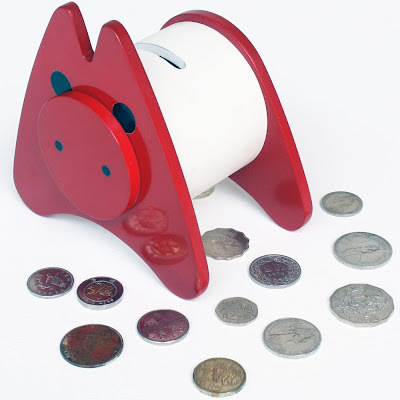 So far, nothing out of the ordinary, but since the “piggy” bank was so cute, the children did not stop to asking for it, and their parents opened deposits accounts just to get the prized elephant-shaped piggy bank. ... The word spread like wildfire and the precious Norsu Elephant Bank by Palaset soon became an icon in the Nordic countries, and it is still made with the same cast of 70’s and in the same factory in Helsinki. Update on April 17, 2019: Now I'm finding the Norsu bank at Pop-line in France; the Finnish company also sells the banks. 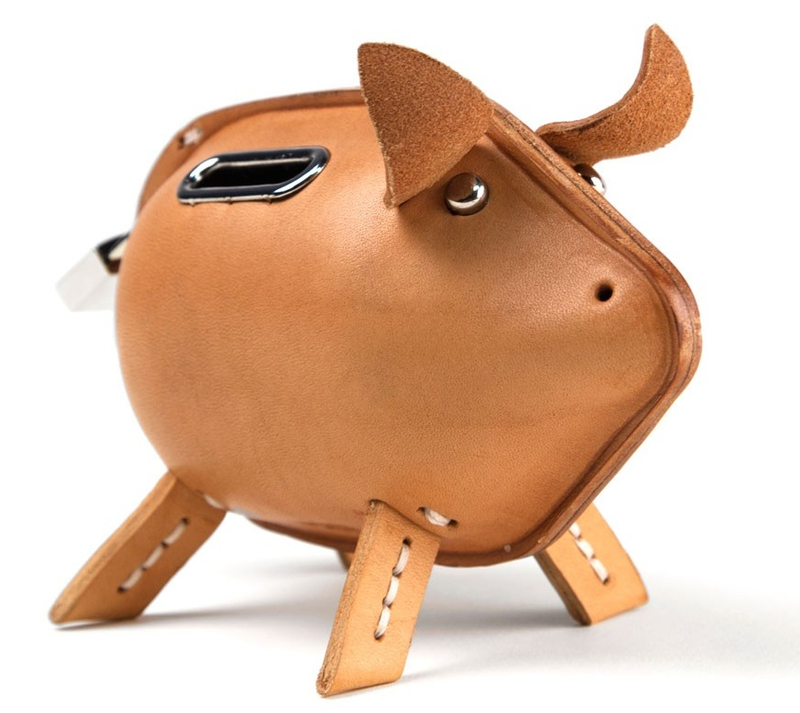 If you really want to splurge, you can get this leather piggy bank at Shinola. 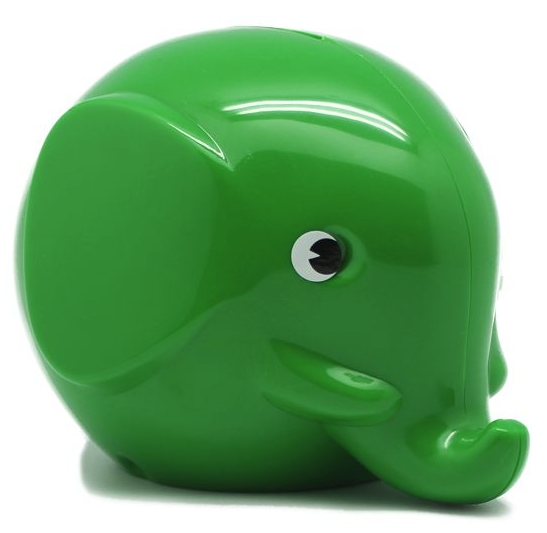 Want a coin bank that’s not a pig (or another animal)? 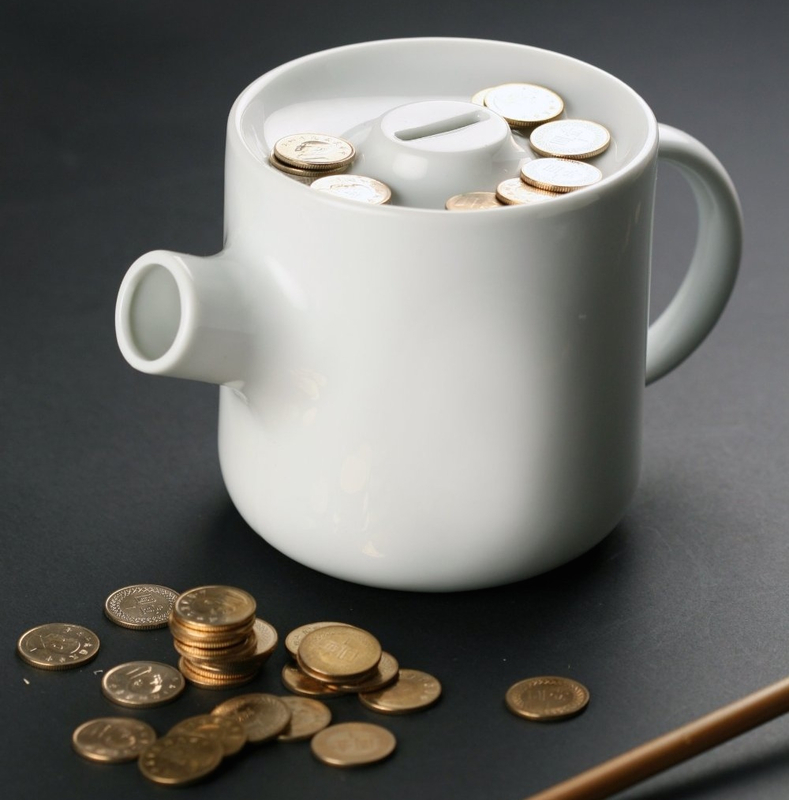 Here’s a teapot coin bank. To remove the coins, you pull out the cork and pour. Update on April 17, 2019: I'm no longer finding this product for sale. I’m always interested in the many ways something as basic as a tape dispenser can be designed to be more interesting. 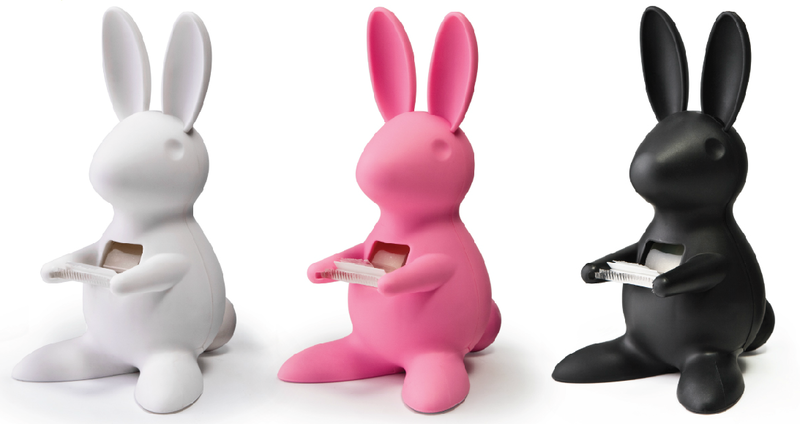 For those who like whimsical, there’s the desk bunny tape dispenser from Qualy in Thailand, also sold by design3000 in Germany and Molly & Fred in the U.K. The owl tape dispenser from Mustard is currently out of stock there, but you can find it at mzube in the U.K. — and there are a couple available on Amazon.com at the moment. Want a tape dispenser that will stay put? The Stickit tape dispenser from Chris Hardy of Design Ideas has a “sticky polyurethane gel base” to keep it in place — but you can gently peel it up when you need to move it. 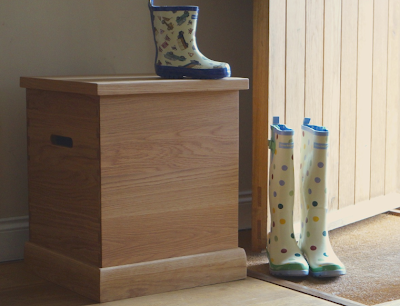 It’s available many places, including See Jane Work, SmartFurniture and Fab. 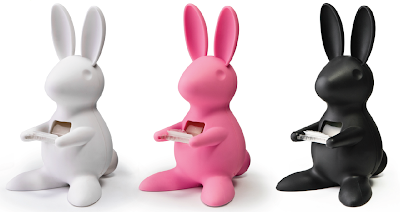 It comes in a range of colors. 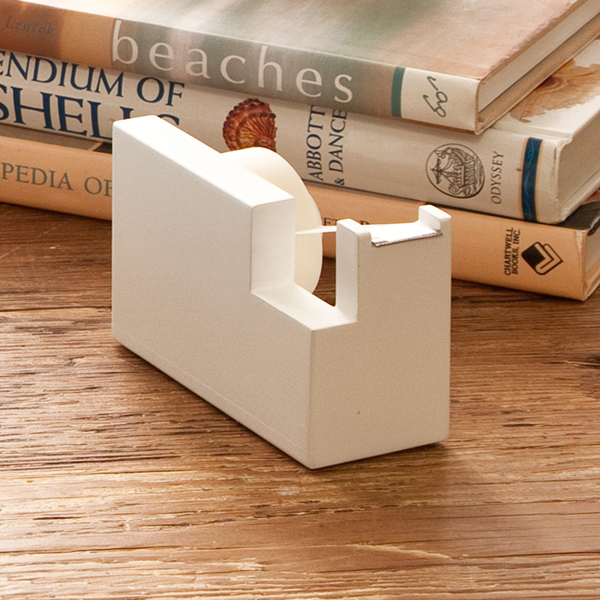 Another stay-in-place tape dispenser (with a very different look) is the Bigfoot from the MoMA Store, with its suction cup feet. 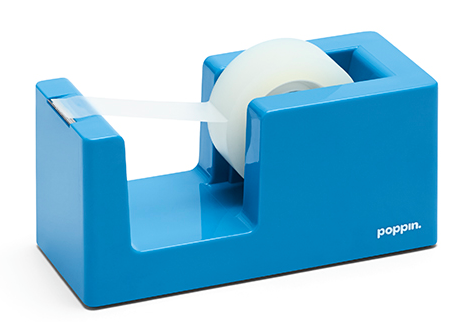 If color is your main consideration, head over to Poppin; you’ll find tape dispensers in 13 colors. 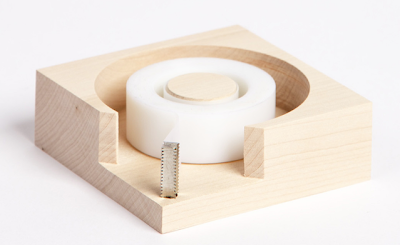 Finally, let’s admire the Notchless Tape Dispenser, which has a special blade designed to give you a straight line when you cut the tape. 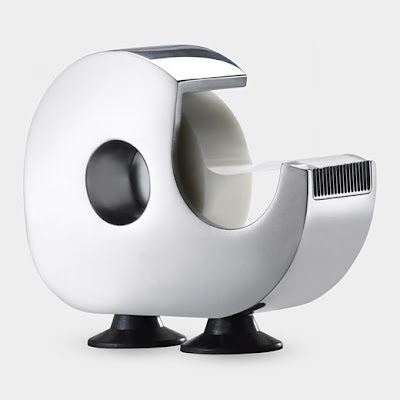 It also looks pretty stunning.